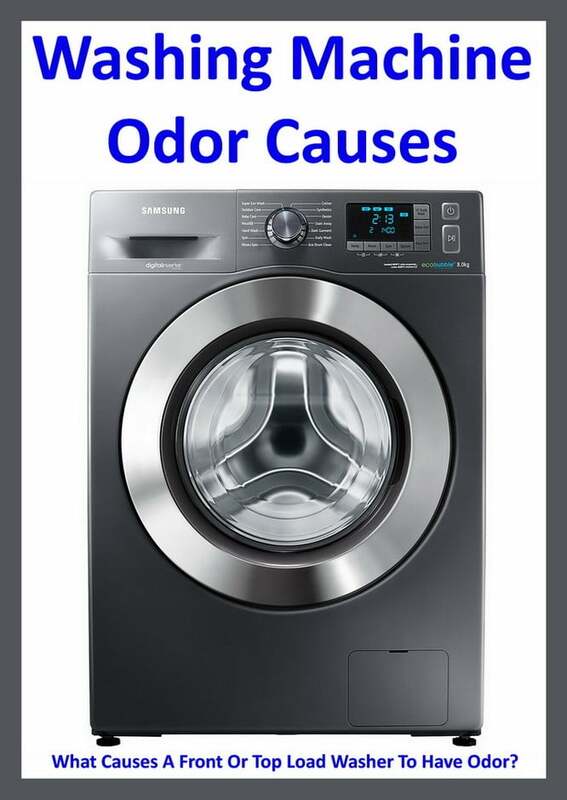 Washing Machine Smelly Odor – What Causes A Washer To Smell Bad? My washing machine is a front loader and it has an odd smell inside. My clothing does not smell fresh when I wash my clothes. I do not know if maybe there is water stuck somewhere or possibly the drain hose or the hoses where the water comes into the washer are moldy or are rotting. Can you give me some advice on what I can check to remove the odor from my washer? Washing Machine Odor – Best Ways to Remove! The sour smelling odor is most likely from the stagnant water that is left behind after every wash. Bacteria and mold can form and cause this odor. The water stays standing in the drum and the drain hose. One smart thing to do to remove or reduce this odor is to wipe all the rubber seals and the inside of the washer out with a wash rag and a simple spray cleaner. 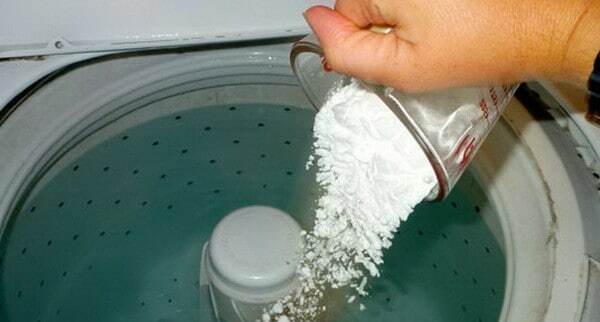 After you have removed any excess water, mold, or gunk that may have been inside the washer, pour in 2 cups of white vinegar right into the drum. Close the washer door and let it sit or soak for 3 hours. Once the 3 hours is up, run a normal wash or rinse cycle to wash away the vinegar. You can also use baking soda or a commercial washing machine cleaner product. By letting the vinegar sit, it will kill and clean out any mold or smells that may be inside the drum and hoses. Running the washer in rinse cycle after letting the vinegar sit, will flush the drain pump, inside drum, and the drain hose. You may need to perform this a few times to kill the odor for good. HINT: Whether you have a front load or top load washer, you should leave the door open after you wash a load of clothes. By keeping the door open you are letting the inside of the washer air out therefore letting the stagnant water evaporate and will not be able to cause mold or bad sour smells. If you are concerned that the drain hose may be causing the odor, there is a valve that stops the water from coming back though the drain pipe after its stopped draining. So more than likely the odor is coming from the inside of the washer drum. 1 – Use a bit of bleach or commercial washing machine cleaning detergents to kill the bugs. These bugs or bacteria make the smell that can be in the stagnant water. Never use any type of cleaner that is corrosive as it will cause damage to your washer. 2 – Make sure you clean out the lint trap on your washer (front load washers only) as stagnant smells can come from there also. Find your washer manual or search online for the instructions to clean it out. Clean it out regularly as the lint trap or drain pump clean out filter catches any gunk or grime that goes through your washer. Keeping the lint trap or filter clean will keep your washer smelling fresh. The filter is located at the bottom front right or left on most front load washers. 3 – You may have hard water build up inside of your top load washer basket and elsewhere. Hard water build up can cause smells to never go away. You can use a use a descaler cleaner to try and remove the hard water if you choose. The best way to remove the hard water smell is to remove the washer basket using a spanner nut wrench. Once removed, clean out the basket and the insides of the washer to remove any hard water and reassemble the washer. Run a wash cycle with vinegar afterwards to clean out any hard water that may still be present. You can find YouTube videos on how to remove the washer basket for cleaning purposes. 4 – You could also pour vinegar down the fabric softener dispenser. This cleans out the dispenser where the fabric softener runs through and can clean it out if the smell is coming from that area. After pouring the vinegar into the fabric softener dispenser, run a rinse cycle. 5 – Most commercial washing machine cleaners will get rid of the sour smell also. If you have hard water use a descaler first and then the commercial cleaner. The bacteria that causes the smell can come back on the limescale in the outer drum. So constant cleaning may be necessary. 6 – Use a few tablespoons of Oxyclean in your washer with most of your clothing loads. This can help to clean not only your clothes but cleans the washer out at the same time. 7 – Stop using so much fabric softener as this makes a sticky area for the bacteria to stick to. 8 – If it is a front loading machine clean and dry the rubber door gasket in all areas after every single wash and leave the door open when not in use. These cleaning methods work with all washing machines including front load and top load washers and brands Whirlpool, LG, GE, Samsung, Kenmore, Frigidaire, Estate, and more. If you have other ideas or tips to clean out the odor from a washing machine, please leave a comment below to assist others. I bought a brand new EXPENSIVE Whirlpool washer/dryer set last year. They do a good job but the washing machine has a terrible odor. Terrible! Why can’t Whirlpool make a washing machine that drains out all the water like they have always done in the past??? I’m sorry I bought this set. Should have just kept my old ones. Really regretting this decision.